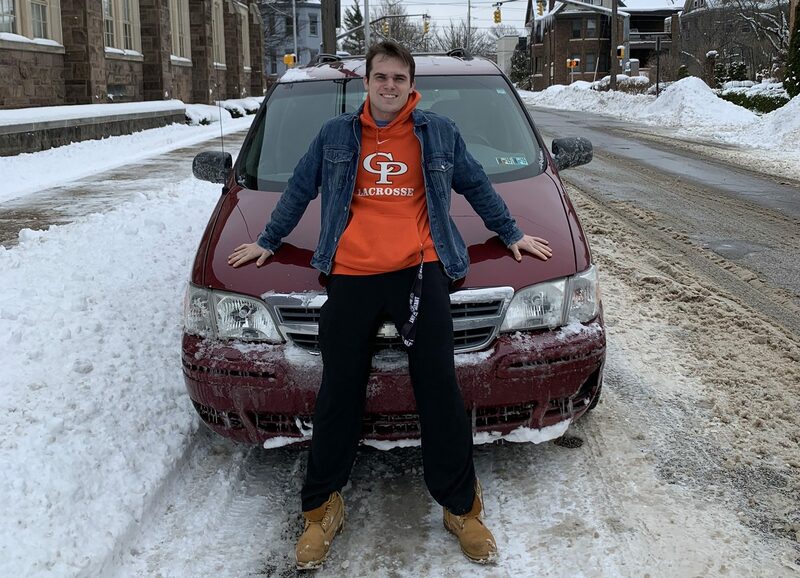 Referred to as “The Crab Shack” “Lobster,” and “Good Kid D.A.A.D City,” Prep senior Mike Norfolk’s 2004 Chevy Venture minivan is an absolute beauty. The vehicle was totaled several years ago, but this zombie car was resurrected and put back on the asphalt in 2015. Coated in faded, dirty maroon paint, along with numerous patches of duct tape, rust, and dents, this vehicle represents the pinnacle of automotive production at Chevy. It’s hard to describe the problems Mike’s car has, mainly because of the sheer amount of problems it has. Starting with the interior, the speakers are utterly shot and blown out. The heater works about 30 percent of the time, and his A/C is completely broken. If you want to eject the cup holder so you can place down your beverage, you’ll have to spend a minute to finagle it out. The fabric of the seats are pretty worn down, and there’s a variety of drink and food stains on them as well. Also, random lights sometimes turn on, even when they aren’t warranted. “The oil light turns on all the time, even when I get an oil change.” Norfolk said. A positive feature of the interior of Mike’s car is it’s spaciousness. “There are only like 7 seats in the car, but if I really wanted to I could fit 25 people in it,” he stated. Moving onto the exterior… where to start? The car has surprisingly good acceleration; however, caution is required with this feature. The car shakes and quivers when it reaches 65 mph, and there is no telling what’ll happen if you go beyond. Moving on from the engine, let’s examine the other exterior features of this car. The windshield wiper mechanism is broken, meaning that it probably isn’t the best vehicle to take out in the rain. Speaking of the rain, the traction control on this van is… less than ideal. On the left side fender of the Venture, there is a demolished portion covered in maroon duct tape from when someone hit his parked car. There is also a scratch on the vehicle as well, from when he backed into Prep legend Mr. Alexa’s parked car. “I didn’t see it. I’m not sure what else you want me to say,” Mike responded when I asked him about how he hit Mr. Alexa’s car. In retrospect, Mike’s car has gone through a lot. But when you look through all of its blemishes and shortcomings, you’ll notice a strong, reliable, and resilient car. So it has a broken windshield wiper system and a dysfunctional traction control system. Who cares?! It’s been in multiple accidents, has bumps and bruises all across it’s plating, and was even brought back to life! It deserves the spotlight. Therefore, Mike Norfolk’s 2004 Chevrolet Venture is February’s student vehicle of the month. Congratulations, Crab Shack!